The symbol of eight immortals is considered to be an especially powerful cure because we are now in the so-called period 8 feng shui. Number eight, in general, is very lucky, as it is the number of infinity and never-ending blessings. So, just by bringing the presence of any powerful beings in number 8 we are already magnifying their properties in an auspicious way. Who are the eight immortals, though, and what is the specific energy they bring to a home or office? How is each one of the eight immortals different? And, more importantly, how is this symbol, or cure, used in feng shui? Where do you display it and for what? Let's see. As with most feng shui cures, the eight immortals are a Chinese symbol of prosperity and longevity. Think of Fuk Luk Sau, for example, or the Laughing Buddha. Being a popular symbol, the eight immortals are often depicted in various art forms - from statues to wall hangings to various household items. Being an old, culturally specific symbol also means that there is a variety of legends, myths, and interpretations as to what is the history and the meaning of the eight immortals energy. To put it in very simple terms, the eight immortals are supernatural beings - of course! - who are available to help humans in their various aspirations. Because there is eight of them, it is only logical that each one would be better at some things than the other, so just like with the Three Star Gods, or Fuk Luk Sau, the eight immortals have their own unique duties and responsibilities. The first thing that is interesting to notice (at least it is interesting to me!) is that two of the eight immortals are women. This is not often seen in Chinese mythology where women mostly play a subservient role. The two very popular feng shui symbols and female deities - Kwan Yin and Tara - are actually adopted from other cultures. Another interesting fact is that, along with gender differences, the eight immortals appear to encompass many other differences. Some of the eight immortals are poor, some are rich, some are young and some are old. There appears to be at least one legend in the Taoist tradition about each one of the immortals. There is beauty and unique individuality in the description of each immortal. For example one of them - Han Hsian Tzu - is the happy immortal that always plays the flute. He can make flowers bloom with just his will, and has the gift of taming wild animals with his music. Another immortal - Tieh Guai Li - is in the body of a lame beggar carrying a double gourd, and yet another - Tsao Guao-chiu - is the finest you can expect from a highly cultured court person. If you want to know specific details about each immortal, I recommend either the Wikipedia or the FengShuiBestBuy info. For our purposes, let's look at the use of this symbol as a feng shui cure for luck and prosperity. 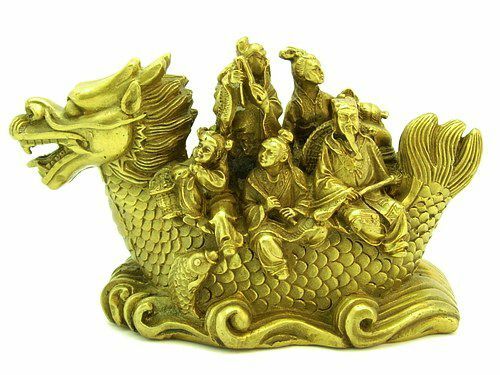 Usually, you can either find the image of all eight immortals in a dragon boat going to heaven, or each one depicted individually. The most popular feng shui use of this symbol is of all eight immortals as it is believed to bring a multitude of powerful blessings. The eight immortals usually will be displayed in a high place with good energy, such as a beautiful table in your living room, or as a focal point in your main entry. Be sure not to display them in your kitchen, bathroom or bedroom. You can choose either a sculpture, a painting, or even a vase with the image of all eight immortals. Best bagua areas to display the eight immortals are East, Southeast or your lucky direction. If you want to display only some of the immortals, you will have to find out more about each one, as well as the best direction to display it. It is considered that each one of the eight immortals oversees a specific bagua area with its own element, colour and guardian animal. Even though a more rare feng shui application, it is still quite popular, in which case I would recommend this detailed article. For example, if it's wisdom one is looking for, then the immortal Chang Kuo-Lao will be of help. North Bagua area is his domain, water is his element and horse is his magical animal. If you need someone to "slice thru bad energies", then Lu Dong-Pin is the one to look for and place in the West Bagua area. Metal is his element and the tiger is his magical animal. All in all, the eight immortals energy is fascinating, powerful and quite captivating to explore. If you resonate with the energy and image of the eight immortals, see if your home or office can benefit from this popular feng shui cure.